The MC3090-Z is a business-class handheld RFID reader designed specifically to extend the benefits of RFID beyond industrial spaces and into customer-facing and business environments. 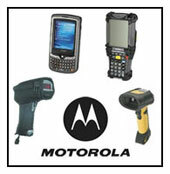 It starts with the signature rugged design and high performance for which Motorola's industrial handheld RFID products are known, and adds the ergonomics required for all-day comfort and ease of use. Add a groundbreaking new antenna design that drives RFID performance to new heights and the result is a highly versatile device that is at home in customer-facing environments, from retail stores and healthcare facilities to the office. Motorola MAX Rugged: meets and exceeds MIL-STD 810F standards for drop, tumble, and sealing. Enables easy and cost-effective porting of applications from many other Motorola mobile computers. Warranty Terms The MC3090-Z is warranted against defects in workmanshipand materials for a period of 12 months from date of shipment,provided that the product remains unmodified and is operatedunder normal and proper conditions.